Golf is one of the most gripping sports on the planet – and The Open is no exception. The Open is the only one of the four majors played on British soil – in fact, it’s the only golf major not played in the United States. 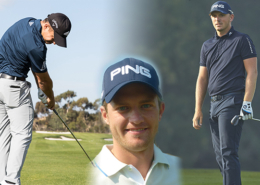 It’s a huge event in the European Tour – and regularly features golfing greats from the world over. Being the oldest and most well established golf tournament in the world, The Open is loved by golf professionals and fans alike. It is also the most international of all golf majors – the Open draws a field of players from each corner of the world and fans from everywhere in between. Lifelong golf followers and more recent converts alike there will be something for everyone at Portrush. Experience first class hospitality at Royal Portrush and witness golfing greatness. While the exclusive hospitality areas will help you entertain any guests to the highest standards, the premium golf on display will thrill any sports fans. Eventmasters are proud to be a part of The Open. We’ve brought guests to The Open for several years now, and it’s one of our favourite events each year! 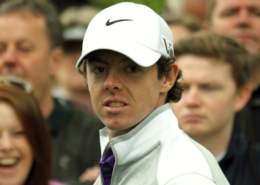 Rory McIlroy wins the Players Championships with less than a month before the Masters and in the year that The Open is to visit his home course. He is determined that 2019 will be his year. The Open is unpredictable as golf can be. We have our eyes on a few up-and-comers with promising careers ahead of them who have a good chance on the unpredictable course at Royal Portrush. The event is set to be huge! 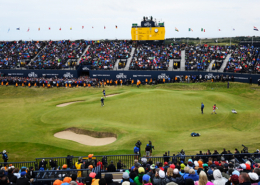 Find out about the favourites to win The Open 2019, what happened last year at Carnoustie and the course at Royal Portrush Golf Club in our Open 2019 preview. Unsure where to stay the night while visiting Northern Ireland for The Open? Explore some of the best hotels in the area with our guide to Portrush hotels. The Open is one of the most established golf majors, so there is wonder there are so have been so many memorable and iconic victories at the championship tournament. Read about the Open winners here. The Open 2019 in Royal Portrush, Northern Ireland is the ideal location for impressing guests. Stunning coastal beauty, high-level sport and premium VIP facilities combine to be an event for savouring. The 38-year-old Englishman, who placed second at The Open this year, has made a return to the top spot after a month and a half away, after bringing taking the win at the Turkish Airlines Open. Over the weekend, we heard news about the upcoming super-match between two former winners of The Open: Tiger Woods and Phil Mickelson. The course at Royal Portrush is one of the greatest links courses the world over. It’s frequently listed as one the top facilities in magazines and awards ceremonies. With views over the North Atlantic and the peacefully dramatic Northern Irish countryside, guests with Eventmasters Corporate Hospitality are sure to enjoy their VIP golf hospitality experience. There are always headlines and exciting news features from the world of golf and updates about The Open – follow our Open news pages and blogs to never miss a beat! Wednesday at The Open is the last practice day – an excellent and unique opportunity to foresee how The Open will play out. If you visit The Open on Thursday you’ll witness the greatest players from across the globe tee off on their quest towards the title of Champion Golfer. Things pick up pace on Friday at the Open – with the competition leaders moving ahead of the pack. You and your guests are treated to some of the most competitive high level golf on Earth. The penultimate day of The Open, Saturday, is always a fan favourite, with the thrills of the week starting to mount to their peak. Sunday at The Open is when the action mounts to a thrilling peak – and the title of Champion Golfer is given to The Open’s winner.